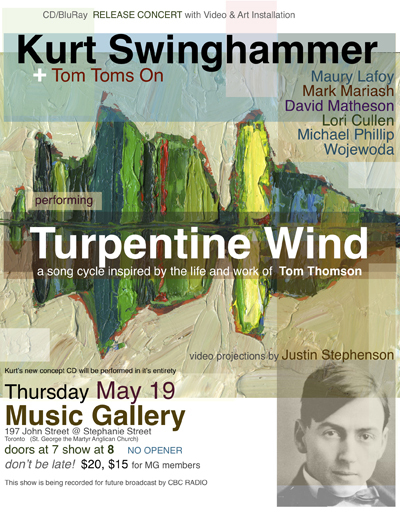 Special performance of Turpentine Wind – the new concept album about Tom Thomson with TOM TOMS ON band, art installation and video projections. CBC Radio will be recording the show for future broadcast. TOM TOMS ON – Maury Lafoy 0n bass, Mark Mariash on drums, David Matheson on piano, Lori Cullen on backing vocals, Michael Phillip Wojewoda on front of house sound and nature samples. 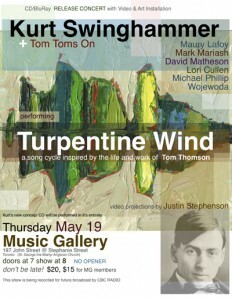 May 19 at the MUSIC GALLERY – 197 John Street @ Stephanie St. – north of Queen. If you’ve not been to this venue, it’s really cool – an old church in the heart of Queen West with a great vibe. doors open at 7, show at 8 – don’t be late! tickets $20 at door – check MUSIC GALLERY site for advance tickets. Turpentine Wind is a 12 song CD with a BluRay disc of ambient instrumental surround sound remixes set to painterly animations. It is sold bundled with an original, signed 8″x10″ WAV file painting by Swinghammer. These will be available at the show.